Best Door Access Control Systems - Top-Rated List in 2019! 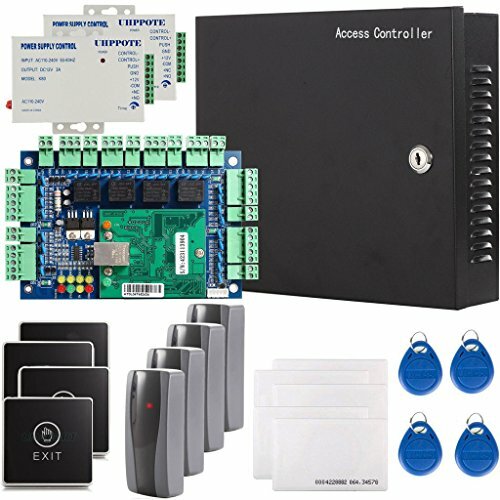 A door access control system is a combination of software and hardware that control the opening and closing of a door. Basically, they allow or deny access based on preset requirements. While military and commercial advanced electronic locking mechanisms have been in place for quite a while, private use is becoming more popular, especially for security-minded homeowners. 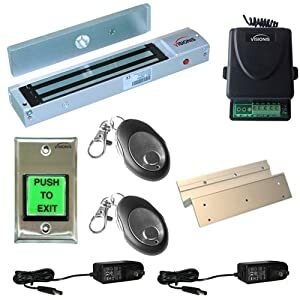 Also, smaller commercial and hospitality companies are transferring over to the more popular electronic controlled door access systems. The added benefits of a door access control system include recording time and identity usage of the door, triggering other electronic systems such as surveillance camera’s and also reducing the risk of losing a key. Another benefit is controlling access to any individual or group and managing the access based on different variables, such as time-related or per pay methods. 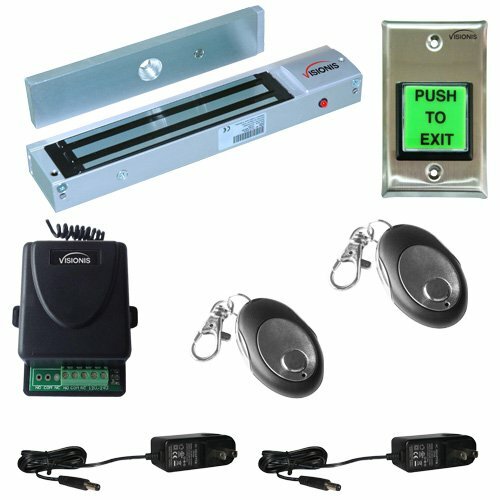 Since there are many types of door control systems and since this review article is aimed at personal and small commercial users, I will not go into the more complex systems found in medical research facilities or military installations but concentrate on your stand electronic door access systems. This is the industry standard and is found with virtually every application. The access card is an electronic device that signals the door lock and opens it. Access cards are individual so you can assign a user ID to each one, and this will allow recording who and when activated a door. The card reader is the electronic device that reads the access card. There are two basic options, the proximity reader or the inserted reader. The proximity reader will scan the area around it for activation, while an insertion reader requires the card placed within a specific location for activation. These come in many shapes and sizes and configurations. They can be basic 9 keypads to complex pads that include fingerprint reading as well as a code. In general, there are two options available for an ACK, either an individual code for each ID card holder, when the keypad is integrated with an access card or a door specific code when there is only a coded lock. This is the physical locking mechanism that is needed. It is installed in the door and the frame and comes in many configurations. 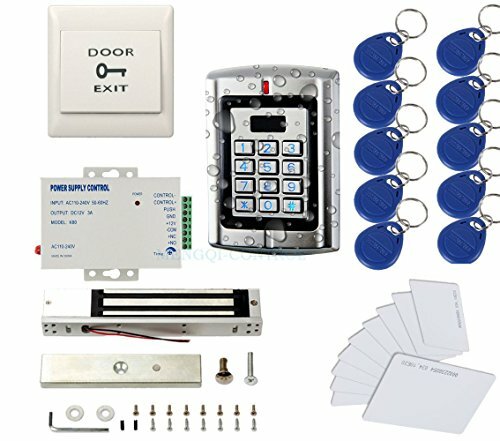 Basically, any door access control system requires the actual locking mechanism to be installed and linked to the software for activation. Access control field panels, or “Intelligent Controllers,” are devices that are installed in each building where door access control is installed. This means that for every building a separate unit has to be installed, and the number of units installed varies with the number of doors that have to be controlled. This is the brain of the operation, and it can sit on a standard desktop or laptop computer, or in a designated server. One computer is usually enough to manage and control multiple doors, even in a hotel or large complex. 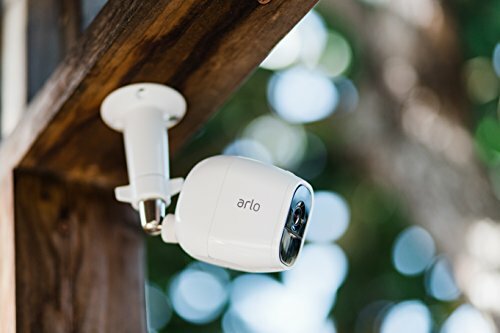 However, when added security features are included, such as motion detectors, or video activation, then a separate designated server is required to handle the multiple activations and memory storage. After installation, all people that require access have to be entered into the software system and provided with codes and cards. You can control access per individual, or you can control access per door and a mix of both. For general home use, such as a front door, it is enough that you designate a standard access card for every family member. “Door-Forced-Open” which is when a door is opened by a standard key, that is used to circumvent the electronic lock or is forced open. “Door-Open-Too-Long” is when you decide that your front door or any door should not remain open for longer than a specified time. This will be recorded in the system. Door monitoring functions allow you to add an alarm in such instances. Some advanced systems provide an automatic unlock feature that is connected to the fire alarm system, as well as accessible to the computer that controls the system. Most of the more advanced systems record all door movements, and this gives you the ability to view all activity whether it is suspicious or not. Valid Access, when code or card is used to activate the door. Invalid Access Attempt: when someone is trying to gain access but does not have the correct code or card. Door-Forced-Open (DFO), when the door is forced open from either side. Door-Open-Too-Long (OTL), when the door is left open for a period longer than designated. Equipment Failure, when a specific door has an electronic or electro-mechanical failure. Power Failure, this is recorded when the whole system suffers from a mains power failure. 1. 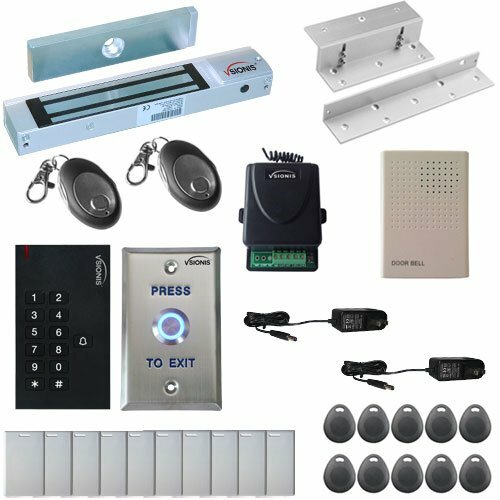 What do you need securing and why do you want an electronic door access control system? 2. How many doors will you be securing? 3. What kind of security measures will you need? Personal, group, individual door? 4. 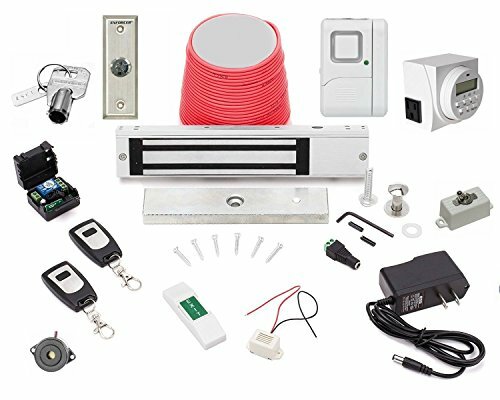 What Security system technology and identification options do you need? 5. What Access Reporting, user and visitor management, and Time tracking software do you need? 7. How complex is individual door Maintenance, as well as whole system maintenance? 8. Who provides you with quality Customer Support, Training Availability & Self-Service Documentation? As you can see, the decision to buy an automatic locking system is not as simple as it is to buy a door. You might need such a system for insurance needs, or you just want to feel secure with advanced technology. If you are a business, you might need such systems for higher control over internal movement and accessibility. No matter the reason, even if you are deciding to buy a simple system for your home, you should really consult an electronic security system specialist first. They deal with these types of technology and know what is best for you and which companies [provide the best maintenance and support in your area. I prepared this review of the 10 best electronic security door control systems with residential use in mind. These items presented here are all easy to install, even the ones that seem complex, are actually not too difficult. 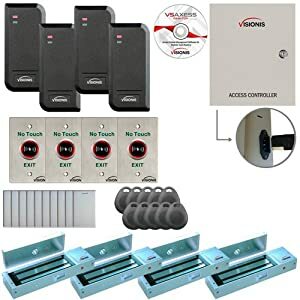 After you decide to buy one of these door access control systems and you are still unsure, then I do strongly suggest you ask a security specialist to come and install the device you purchased. One final word, I am not going to provide too many technical details about each product, these are available in the product specification sheets. If you want basic and straightforward, then Gianni’s GEM technology is extremely reliable and secure. Their electromagnetic locking system is strong and versatile. The GEM series can be fitted with most doors and frames and also comes with optional auxiliary mounting brackets. The GEM MOV prevents current surges and spikes. It comes with a built-in bond sensor and a time-delayed alarm system for doors left open. This is a pretty standard and useful locking system for basic requirements. They have a patent pending on most of their designs. UHPPOTE provides a comprehensive yet basic system that is easy to install and uses a standard 110V energy source. It transmits via TCP/IP, and the reader is a Wiegand 26-bit. The operating system is not limited to any type so you can manage it from any PC with Windows, or any mobile device with iOS or Android. This system controls up to 4 doors, and you use a proximity access card to activate the mechanism. The maximum distance of the reader to the controller is 100 meters. However, I suggest you don’t go over 80 meters. This won’t be a problem in most homes. The database is MS Access and SQL, so its easy to integrate into any windows compliant security system, and data is transferable to Excel and word if you need this for reports. The RFID Reader communicates using 125Khz frequency. Overall a standard unit with good features, easy to install and easy to operate. Visionis (which will feature here a lot) is an exceptional company providing exceptional high-quality products that are modular. This means you can (and we have) match different components to make up a combo that can handle anything from one door in simple mode to many doors in complex interactive mode. VIS-8004 – One Channel Receiver 315mhz. This receiver is wireless and can be integrated into any door system. VIS-8005 – 1-Channel 315 MHz Transmitter (Remote) which transmits over a 1 channel 315 MHz frequency. This transmitter is used with the VS-8004 and has over 1,048,576 codes of programming, so you are secure that your system is safe. VIS-3200 or VIS-3201 – 2.4GHz Indoor Wireless Exit Button Receiver Keypad and the Reader Access Control. It can handle up to 500 users and has a range of up to 50 Feet. This is a single door wireless controller. The keypad can store 500 PIN or card users, and the exit button can work for up to 12 months. It uses 3 AAA batteries and will work for 12 months if used 30 times day. This is an indoor combo. for outdoors you will need different modules. This is the UHPPOTE stand-alone keypad activated door control system. Its good for one door and is very easy to install. If you only have one door and want a mild deterrent, just install this system. It can support up to 1,000 users and is activated by both a key code and a card with a PIN. This is a very good option for a small residential complex. This is a self-contained system, so it does not connect to a PC. This is another Visionis combo, this time for a single door remote activation. Which means no keypad, just a simple receiver, and a transmitter that can support up to as many key holders that you supply. Since there is no keypad, there is no need for a code, only a remote activation. This unit is very good for garage doors. VIS-8005 – – 1-Channel 315 MHz Transmitter (Remote) which transmits over a 1 channel 315 MHz frequency. This transmitter is used with the VS-8004 and has over 1,048,576 codes of programming, so you are secure that your system is safe. VIS-7000 is a green LED push to operate button and is used for a one-way exit system that does not require the user to have a remote. This is especially useful in residential blocks where visitors can leave without using a remote. This is the Linear controller which allows you to support up to 3 doors. This is a standalone unit and requires the communications module to complete it. This system comes with the Hub Manager® Professional software that allows you to control and record the system with your PC or laptop. VIS-APROXCARD-26TH COMBO This is the proximity Smart Entry Card, which is only 1.8 mm thick. 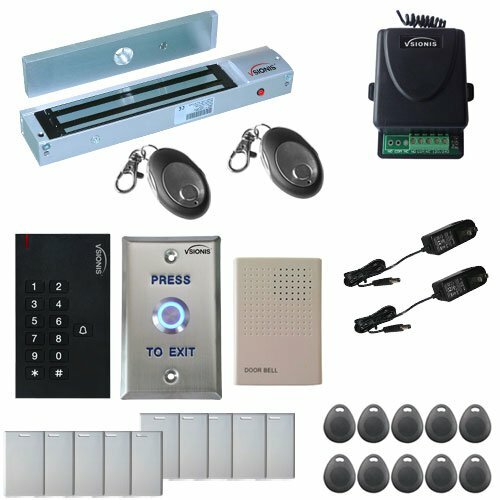 Mengqi weatherproof door access control system is for outdoor use. It supports access cards, PINI and an access card and PIN combo. It can be programmed to 2,000 users, and the card is a 125Khz unit transmitting to a Wiegand 26 to 37 bit programmable I/O. 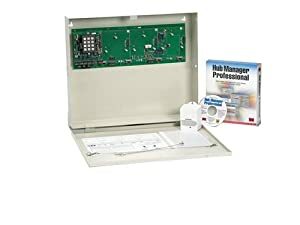 I tried this system out, it was very easy to install and operate, and is reliable. It also stood up to extreme weather conditions so I can recommend this device to anyone seeking a reliable yet simple solution. 1 Electric Maglock that provides 600 lbs. VIS-APROXCARD-26TH COMBO This is the proximity access card that is only 1.8 mm thick. Stay in touch – If you live in an apartment building try to involve the building management or committee. It is possible that if there is no such system installed, or if the system installed is old, you will need their help and permission to replace that main entrance. As for your apartment, also let the building management know so that they have access if you are not around. 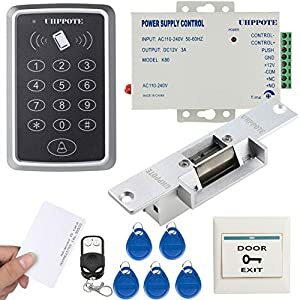 Safe or secure – The difference between fail-safe and fail-secure is what happens in a power outage situation., Fail-safe means that the door will unlock when there is a power failure, while fail-secure will keep the door locked in such an instance. Most residential units use fail-safe systems, fail-secure is more of a security measure in sensitive areas. Modular equipment – Try to find a company that provides many different systems and modules so that you can always add, upgrade and change configurations as you develop more needs. Do not exceed – One of the biggest mistakes that many people make is to either buy too much stuff that they really don’t need or buy expensive equipment that is not suitable for their requirements. Matching your needs to the system is best done by a professional. So, when you do shop around, ask for advice, don’t take any advice for granted, and don’t rely on just one opinion.